Sid Meier's Civilization VI: Gold Edition is the perfect entry point for PC gamers who have yet to experience the addictive "one more turn" gameplay that has made Civilization one of the greatest game series of all time. 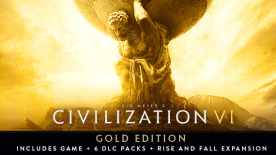 The Gold Edition includes the Sid Meier's Civilization VI game, six DLC packs* and the Rise and Fall expansion. THE WORLD'S GREATEST LEADERS: Play as one of 36 different leaders from various civilizations around the world and throughout history. Build an empire of lucrative trade routes with Cleopatra of Egypt, flex the military might of your legions with Trajan of Rome, or develop a powerhouse of culture with Hojo Tokimune of Japan. Each of the leaders can be played any way you prefer, with unique abilities, units, and infrastructure in their quest for victory. ©2016-2018 Take-Two Interactive Software, Inc. Sid Meier's Civilization, Civilization, Civ, 2K, Firaxis Games, Take-Two Interactive Software and their respective logos are all trademarks of Take-Two Interactive Software, Inc. All other marks and trademarks are the property of their respective owners. All rights reserved.